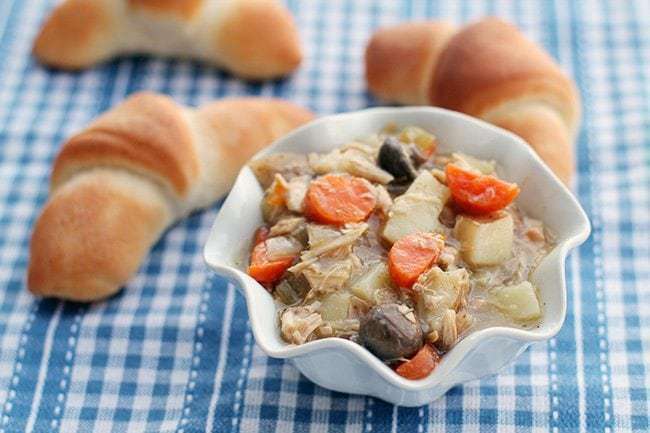 What I loved about this slow cooker chicken stew is that you only need enough chicken say, from leftovers, and the rest is mainly vegetables. Indeed, I had roast chicken leftover and we were a little tired of soup. It’s funny how one can trick their mind when eating something because really, this really is just a soup with less liquid and more vegetables. The heartiness makes it better somehow. Place the chicken, garlic and vegetables into the slow cooker. Mix together the bouillon and water, then pour over the vegetables. Cook on low for 7-8 hours, until the vegetables are soft. Take the cornstarch and mix it into a small amount of water. Stir into the stew, quickly whisking it in. Cook the stew for 10 minutes more, letting it thicken. At this point you can add in the chicken to heat up if you don’t like your chicken to break down and didn’t slow cook it all day. You may add more cornstarch to get your desired thickness. A confession: My crock pot has literally not left my counter the past month. I’ve washed it and put it right back into the same place to be used again. I am quite seriously making almost everything in the crock pot lately, from stews to roasts to pasta. We are so busy – like every other family right now- that the only way we are going to have a nice hot home cooked meal is if I throw something in the crock pot for when we get home. The chicken is going to break down and shred throughout the stew, which makes those two cups go a long way in the end. Play around with the vegetables you like in it, I love mushrooms in my stew and thought they were just fantastic for a nice change. Add onions, celery, mushrooms, whatever your heart desires. Now, there are a lot of people that don’t like the way that cooked chicken breaks down after slow cooking all day. IF you are one of those people, then add the chicken in at the very end to heat it up. You have a choice of which method you want to do here. Play around with the thickness at the end, depending on what vegetables you put in, there will be more/less liquid. Mushrooms and celery add liquid, potatoes and carrots not as much. I’m thinking my crock pot deserves a name, he’s been working so hard and heck, will continue to work hard. I can’t remember the last time I used it so much, three or four times a week is a new record for me. Has your crock pot been doing overtime with the Holiday rush, snowy weather and cold days? PIN THIS RECIPE to your SLOW COOKER DINNER RECIPES Boards and Remember to FOLLOW ME ON PINTEREST! 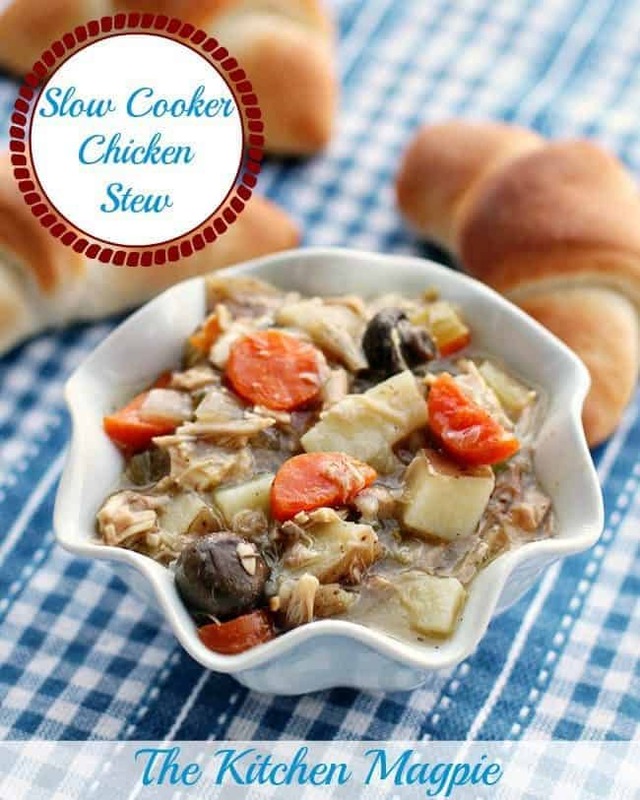 Delicious, hearty slow cooker chicken stew - perfect for when you need a heavier meal than chicken soup! Mix together the bouillon and water, then pour over the vegetables. Cook the stew for 10 minutes more, letting it thicken. At this point you can add in the chicken to heat up. You may add more cornstarch to get your desired thickness. Serve and enjoy. This was perfect! Thanks for the recipe! Five stars! Excellent recipe it’s in the pot now i’ll post back how it turns out. Especially since E will only eat beige at the moment. And brocolli. This will be made for minions on Tuesday. Wish me luck.